The new Inn at Playa del Rey was just honored as the "Featured Inn" by Country Inns Magazine. 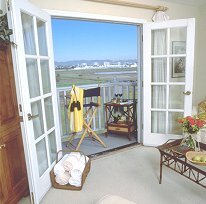 Sister to award winning Channel Road Inn, the Inn at Playa del Rey is located close to the beach and overlooks both the main channel of Marina del Rey and a two hundred acre bird sanctuary. All 21 rooms are just as refreshing as the views with distinctive decor. Rooms facing the wetlands have fireplaces, decks, blue Marina sailboat views, and Jacuzzi tubs. Two "Romance Suites" feature a fireplace in the bathroom next to a bubbling oversized Jacuzzi tub for two. Recently recommended in a Los Angeles Magazine feature which said, - "couples should keep the Inn at Playa del Rey on their speed dial". The village of Playa del Rey offers a variety of restaurants and shops and is just five minutes from Los Angeles International Airport making the Inn the only airport area hotel in Los Angeles walking distance to the beach. This and other Playa Del Rey Bed and Breakfast Inns can be found here in The Register.